Ted Turner and CNN: My Biggest Career Mistake? Ted Turner launches CNN on June 2, 1980. CNN screen grab. 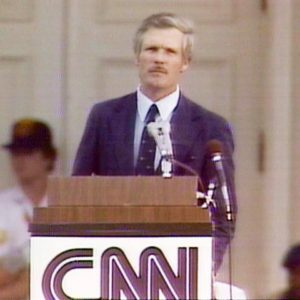 Ted Turner launched the Cable News Network 37 years ago this month. A good enough time to share the story of how I could have been one of the very first employees of CNN. I was a 23-year old reporter for the wire service United Press International, doing both print and radio stories. We were multi-platform before it was cool. I was fresh from my first job out of Stanford University, reporting for the Trenton Times newspaper. I had taken a sailing class during college and that seemed like a good enough reason to assign me to cover the America’s Cup Yacht race in Newport, Rhode Island. Two things you need to know. Ted Turner was the biggest story. And I was the ONLY woman in a press corps otherwise composed of male sportswriters. This meant that I got a lot of exclusive interview time with Captain Outrageous. I scooped the guys from the AP with a report on Turner’s visit to his minor league baseball team in Pawtucket. He also took me to his favorite waterfront restaurant, where I tried not to let on that I was seeing a whole lobster on my plate for the very first time. “Do y’all eat the brains?” he asked, in his distinctive drawl. Since it looked kind of gross, I said no. Turner reached across the table and helped himself to an extra serving of brains. I was working on a story about the hardworking crews on the America’s Cup yachts and was invited to the dormitory for the crew of Turner’s boat, the Courageous. Turner made a special point of showing me the satellite dishes he had installed behind the building. And that’s when he popped the question. “Oh, no,” said my 23-year-old self. “I’m a print journalist and I want to work for the New York Times or the Washington Post. 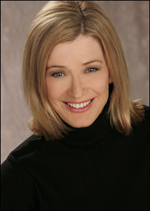 If I went into TV, I’d want to go with a real network, like CBS.” And that was it. 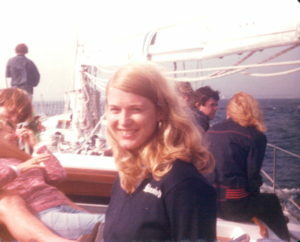 My 23-year-old self on Ted Turner’s yacht, about to make a big career mistake. Was turning down that offer the biggest mistake of my career? I tell this story to journalism students and the working professionals who come to me for talent coaching. It’s usually in response to some grousing about career choices and whether it would be better to stick with traditional broadcast jobs or take a chance with some online startup. I think the lesson here is that you never know where the next big media trend is coming from. I was so focused on my goals in the established news outlets that I didn’t recognize a brilliant idea when I had a chance to be in on the ground floor. Ted won the America’s Cup. As for the CNN boat, it sailed without me. Lesson learned.